The committee’s mission is one of education and communications. It publishes monthly ESOP Newsletter, the ESOP Super Scoop, based on this year’s superhero theme. The newsletter is printed and posted throughout each office and highlights activities, provides educational articles, offers contests and puzzles, and sheds light on the inner workings of the Committee. Other yearly educational opportunities included a presentation on the history of our ESOP, The Value of a Dollar, Statement Reading Guide, and New Participant Training. There are prominent ESOP posters in all our facilities, as well as electronic billboards in several that tout employee ownership. 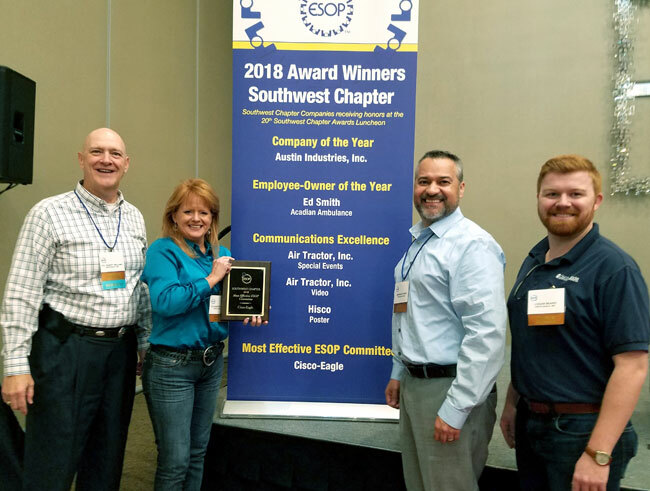 Cisco-Eagle will compete for multiple ESOP awards in May 2018 at the ESOP Association’s national awards in Washington, DC.